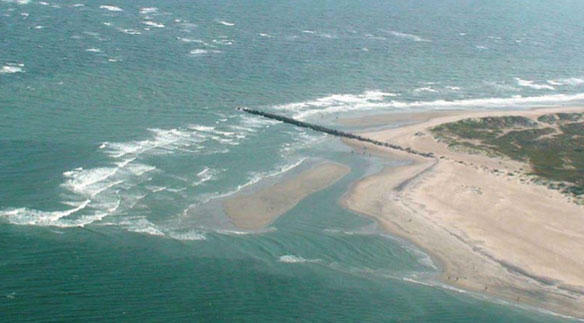 The first permit granted by the U.S. Army Corps of Engineers went to Bald Head Island. The three other beach towns seeking permits – Ocean Isle and Holden Beaches in Brunswick County, and Figure Eight Island in New Hanover County, say they need all the tools available to protect not only homes – but public infrastructure – such as utilities and roads. On this edition of CoastLine, we explore the concerns around these structures and find out why beach communities say terminal groins are a critical and potentially beneficial strategy for shoreline management. Listen to the short version of the story here. Three beach communities in southeastern North Carolina are seeking to build a terminal groin. Bald Head Island is the first municipality in the state to acquire a permit for such an erosion control device, and construction there is already underway. But whether these long, low rock structures at the end of an island will prove to be the key to the expensive and complicated problem of shoreline management is an open question. In 2011, the North Carolina General Assembly lifted the ban on terminal groins to allow four such structures in the state. The remaining three permits are being sought by Holden Beach, Figure Eight Island, and Ocean Isle Beach. Debbie Smith grew up in Ocean Isle Beach in Brunswick County. She’s now mayor of that town. "The eastern end of our Island has suffered chronic erosion for many, many years. Actually, 3rd St is now buffered by a 1500-foot line of sand bags protecting it. There did used to be a 1st and 2nd St... We feel like [a terminal groin] will straighten out our shoreline and keep the sand that’s placed on the beach from falling right back into the inlet." Mike Giles of the North Carolina Coastal Federation, an environmental advocacy group opposed to the use of these structures, says relocating the inlet would accomplish the same end and do less damage. "We’ve known all along that these inlets are volatile, volatile areas and we should not be putting houses or rebuilding houses in these volatile systems that are chronically affected by migration of these living ocean systems." Ocean Isle recently published its Draft Environmental Impact Statement. The public comment period is open until March 16th. A spokesman for the U.S. Army Corps of Engineers says the agency will release a supplement to Figure Eight Island’s Draft EIS in about a month and a half.